Butler of South Carolina for supporting it in his “Crime Against Kansas” speech. Three days later, South Carolina Rep. Preston Brooks, Butler’s cousin, entered the chamber and severely beat Sumner with a cane. The bleeding and unconscious Sumner had to be carried from the floor, while Brooks walked away unscathed. 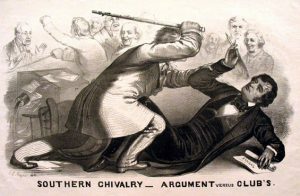 The “Caning” incident made Sumner a martyr in the North, while many Southerners proclaimed Brooks a champion for defending the honor of his relative. 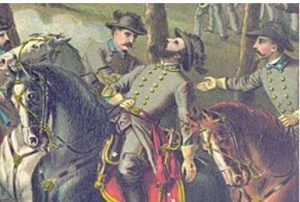 On 2 May in the Battle of Chancellorsville, Virginia, General Stonewall Jackson executed a brilliant flanking attack on the Union right. In a surprise attack, his Confederates smashed into and routed the Union XI Corps under General Oliver O. Howard. That night, while leading a group of officers on a night reconnaissance ride, Jackson was mistakenly wounded by friendly fire. Stonewall Jackson is wounded by friendly fire at Chancellorsville. After the wounding, the ambulance wagon took him some twenty miles away to a home at Guinea Station. The surgeons amputated his left arm, but the bed-ridden Jackson subsequently contracted pneumonia and died on 10 May.